Home / News / Impacts of Education on Personal Development Plan? 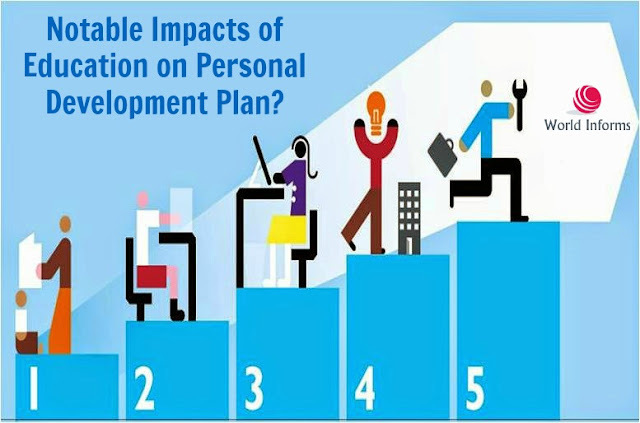 Impacts of Education on Personal Development Plan? Abstract: Education has some notable impacts on the whole process of personal development plan which ultimately enhances the overall personality of an individual. Content: Personal development is a process which basically creates whole personality of an individual by assessing every element of life. Personal development includes psychological growth, physical growth, character growth, increase in needs, and social growth.It covers every single feature of life to develop an individual in a complete form. It has been widely observed that education influences personal development process prominently. This article will discuss few notable impacts of education on personal development plan of an individual. Character building is an important section of personal development process and it has been realized that education influences this section pretty impressively. A child who gains education must have a commendable character, enriched with etiquettes, moral values and respect for others. As they get assistance from teachers and parents, they develop an impressive character traits due to proper guidance. Education develops a child with a strong and passionate ambition in life. Through education, one learns more about the universe and acknowledges that it’ll be a waste of life to simply earn some money for food and clothes. Educated children develop a personality which yearns for ambitious life in order to acquire more besides basic needs. Education provides a straight path to every child by eliminating confusions and enables them to set an ambition in order to live a successful life. Education also impacts the personal development by polishing skills of an individual and making them highly capable to succeed in life. An individual automatically develops higher communicative skills by attending school and college due to excessive interaction with teachers and fellows. By acquiring knowledge about several things, a child becomes capable of dealing with different situations and scores success. Education helps an individual to put his/her abilities to the best use. No doubt, a child grows into a highly skilled person by acquiring education. A person with educational background appears to have a broad thinking pattern, whereas an uneducated individual’s thoughts are narrowed.This is because, an educated person has acquired much knowledge of the world and universe, therefore, he or she becomes able to put that knowledge in best use while thinking about several issues. Education enables you to think with different aspects in order to get a better outcome. In short, education develops an individual’s personality by broadening his/her thinking patterns. Being a part of an educational institution and holder of vast knowledge, a person experiences increased self-confidence. No doubt, the more information you’ll have, the more confidently you’ll conducts dialogue. Education enriches a person with light of knowledge which ultimately makes your personality shine and you feel complete confidence in yourself. Without education, a person might develop inferiority complex and appear shy in every gathering, which will affect whole personality. To conclude, it will not be wrong to say that education impacts personal development notably and makes a person fully composed with essential features and impressive traits. Author bio: Shannara Michael, an educationist and activist working for Assignment doer writing service , wrote this article, who is currently working as child development psychologist in Glasgow.